A Mediterranean coastal town in Catalonia and one of the most popular tourist resorts found at Costa Brava. Just 46 miles (75 kilometres) away from Barcelona so creating easy access via one of the many forms of transport. With five beaches available at Lloret de Mar, there will be no excuses for not visiting the beach which all guarantee glittering golden sands and sparkling clear water that you would expect from some of the best beaches Spain has to offer. At Lloret de Mar, there is an almost unlimited variety of food and drink. Ranging from fast-food, to the best of British to traditional spanish dishes, which are all reasonably priced, there is bound to be something that takes your fancy. Many favourites of tourists are Sangria (sparkling fruit wine) and paella (seafood risotto). Many restaurants will offer a “menu of the day” providing a daily variety of courses while also being available for great prices. There are also varieties such as Mexican and Chinese foods available. Lloret de Mar has been known to attract thousands of tourists just for the nightlife. Offering nightclubs, pubs and bars you are guaranteed to have a good night or few enjoying the dark hours of Lloret de Mar. As the sun disappears behind the horizon, the town bursts out into the nightlife capital of the Costa Brava, with the streets packed every night almost all year round. Directions are not needed here, just follow the majority and you are sure to find the best clubs in town! There are also many places available if you fancy a beer or five but don’t quite fancy the full blown nightclubs. There are also many activities that don’t involve staying up drinking till the sun rises. Such as historic sightseeing and sports activities. There are many leisure facilities available such as athletic tracks, sport centres and football pitches. Holiday shopping is one of the great things about being on holiday. Getting access to goods that aren’t available in your home country or purchasing goods which are available for a fraction of the price. 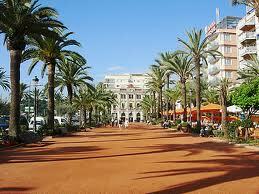 At Lloret de Mar there is a multitude of shops and markets to choose from. The main shopping front is centred in the streets behind the waterfront. There are traditional markets which are held every Tuesday on the Carrer dels Mestres and a municipal market every weekday in the Carrer Senia del Rabic and Carrer Verde de Loreto. Many days will be spent enjoying the seafront of Lloret de Mar and due to the fantastic beaches the resort has to offer the conditions are ideal for a variety of water sports for many a tourist to enjoy, ranging from pedalling boats or skimming the water on a jet ski to diving down to the seabed. Other activities include go karting, bungee jumping, bowling and horse riding. 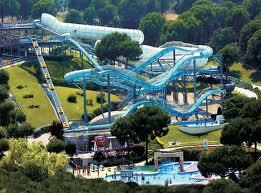 There is also a water park available which can be enjoyed by any age. Many packages are available for sightseers or tourists who enjoy outings, these can include activities such as coastal cruises or partaking in wine tasting in the Catalan countryside. Many popular trips are made to the huge theme park at Salou or Marineland near Blanes, both only a few hours drive away. Those who just enjoy a stroll can opt for a mapped walk along the coast or traditional villages which are inland. The mild Mediterranean climate means activities like biking and walking can be enjoyed all year long on holidays to Lloret de Mar. Temperatures are not extreme, but July and August are the hottest months. You can swing in average temperatures of 22 – 28° Celsius in the summer. You’ll be coming back from your Lloret de Mar holidays with a healthy tan! Book your holiday to Lloret de Mar! At Flysunways.com we have so many offer, it’s not surprising that Lloret de Mar holidays are very popular. Check out all our excellent holiday deals available in Lloret de Mar!